For me this will be the winter of Comme des Garçons Daphne Eau de Parfum. Within half an hour of a dab from a sample tube, I was at my computer ordering a bottle, budget be damned. Its warmth, complexity, and femme fatale vibe were irresistible. At the same time, I think hordes of perfume enthusiasts will detest Daphne. Its sweet thickness might drive comparisons to marshmallow fluff and talcum powder. But I’m smitten. Perfumer Antoine Lie created Daphne using notes of bitter orange, incense, saffron, rose centifolia, Tunisian jasmine, tuberose, iris, patchouli, oud, amber, and vanilla. Essentially, Daphne is an oriental scent featuring tuberose with all the baroque fixings. It’s named for Daphne Guinness, a British celebrity who seems to have earned her fame mainly through eccentric chic and a prominent family. A short film by Daphne Guinness and David Parker. 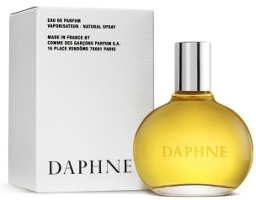 Guinness, in collaboration with Comme des Garçons, has just launched her first fragrance, Daphne; the film “embodies her concept of scent” but is not meant to be a commercial (read more after the jump). Possibly NSFW.